People who have not heard the term “gamification” before perceive it to be about games but this is inaccurate. In order to address this misperception, Deterding and his team researched the various uses of gamification and came up with a definition that states gamification as “the use of game design elements in non-game contexts.” (Deterding et al.) We can see from this definition that gamification distinguishes itself from games by implying that while games are for fun without real world implication but gamification has implications in the real world. Broadly speaking, gamification continues to be applied to various areas of business, technology and society. For this research paper, the focus is on the business and technology aspects of gamification. This leads to the definition by Gartner that states gamification as “the use of game mechanics and experience design to digitally engage and motivate people to achieve their goals.” In this definition, game mechanics refers to the points, badges and leaderboards that are applied to computers, smartphones and wearables and experience design refers to game play, play space and story line(s) to motivate people to change behavior. What this means is that gamification is used to change the norms, attitudes and habits of people and organizations from a current state to a future state through today’s technologies. External Purposes: Organizations use gamification externally for customer engagement. The idea is that if customers are more engaged then this can create customer loyalty. This customer loyalty can lead to brand awareness and consequently more products and services being sold. In this sense, organizations use gamification as a sales and marketing tool that is often applied using websites, online communities, mobile devices and other digital devices. Internal Purposes: Organizations use gamification internally for employee engagement. The idea is that if employees are more engaged then this can help achieve various organizational objectives. Thus, in this sense, organizations use gamification in hiring, training, product enhancements, innovation, performance improvement and change management that is often applied through technologies in the organizations. Initially, when gamification started to pick up steam in 2010, organizations were only interested in its external uses up until 2013. However, Gartner states that this started to change in 2014 where now organizations are interested in using gamification for external and internal purposes. 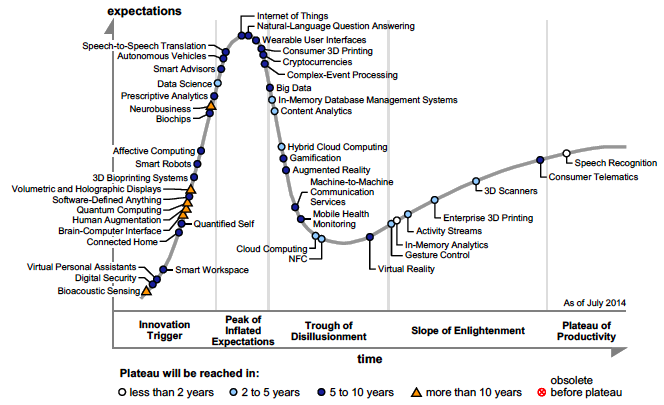 This change is using gamification is reflected in Gartner’s Emerging Technologies Hype Cycle where in 2014 gamification moved to Trough of Disillusionment from 2013’s Peak of Inflated Expectations. 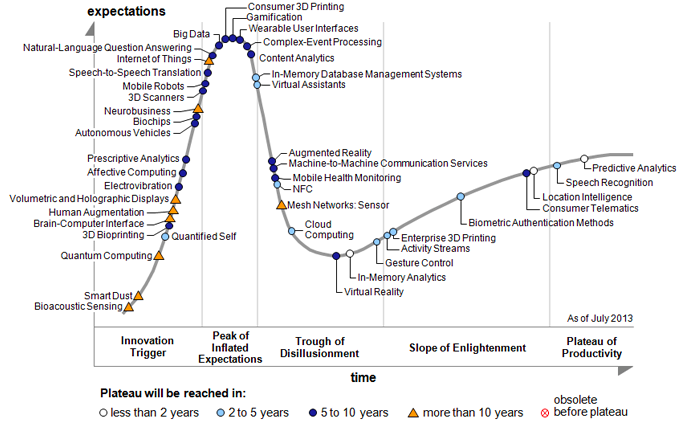 By simply looking at the 2013 and 2014 Hype Cycles one might think that gamification’s days are numbered. But a closer look reveals that organizations are beginning to understand how gamification can be used to not only increase the bottom line but also how it can help them transform themselves. Thus, in a nutshell for our purposes, gamification for organizations is the use of game design thinking to change behaviors internally and externally through technology. In 2010, Jesse Schell’s presentation goes viral and starts to resonate with the business community. Today, the video games industry is a $70 billion industry. Over these last 40 years, it has figured out how to keep people engaged and motivated for longer periods on time. During this time we have seen the explosion of computer devices being used and the creation of the Internet that has given rise to video games that can be played simultaneously online with many users. From a business perspective, some of Coonradt’s principles have been used for creating performance reviews and loyalty programs. As time passes we will see technology and business fields coming together for gamification purposes. Increasing System Usage and Engagement: Salesforce sells Software-as-a-Service (SaaS) subscription services to organizations. One of these subscription services is the Customer Relationship Management (CRM) service in the cloud that is mostly used by the customer’s sales staff. In order to increase the adoption of the CRM services with the customer’s sales staff, Salesforce turned to gamification by creating a game called Salesforce’s User Hunt for Chicken. In this game, game mechanics such as status changes were used to motivate sales staff to use more of the CRM services features. In one case, the customer’s sales staff compliance in using the CRM service increased by 40%. This example shows how gamification was used to create a win-win-win scenario where (1) the customers’ sales staff wins since they become more aware of how to utilize the CRM service to its full potential by using its features, (2) the customer wins since their sales staff is using the features that they have already paid for and (3) Salesforce wins since it creates opportunities for itself to stay competitive by keeping the customer’s sales staff reliant on their CRM services. Increasing Customer Interaction: Dodgeball was the predecessor to Foursquare that used check-ins for events. It was sold to Google in 2005 but after four years of getting very little traction, Google decided to shut it down. Foursquare on the other hand took the check-in concept and used gamification to gain traction. They did this by using game mechanics such as badges and perks to incentivize users to check-in. Today, Foursquare is one of the most popular applications in the world. It has 50 million registered users, 1.9 million listed businesses and it has crossed 6 billion check-ins. This example shows how gamification was used to enter and dominate a market by creating value for the users in the forms of perks. No Value for Users: Google’s social network is called Google+. Google+ has 300 million users who spend an average of 7 minutes per month on the social network. In order to increase the time spent on Google+, Google decided to use gamification. Thus, Google decided to use game mechanics such as badges to give to Google+ users who read Google News. The problem with this approach was that it was not clear what value these badges provided to the users since they were private and added no value to the search being conducted. This example shows how a half-baked attempt at gamification resulted in creating something that users did not find appealing. Lack of Proper Cost Benefit Analysis: Marriot was interested in recruiting and training associates for its management program. In order to do this they turned to gamification by creating a game called My Marriot Hotel. While the initial idea was not bad but as Kevin Kleinberg states in his article, the amount of money spent in creating this game versus the number of people who would actually become managers at Marriot seems to be miscalculated. This example shows gamification is not a remedy for management’s lack of foresight into the actual user base versus the amount of money spent on gamification. While the above questions are not a comprehensive list but it is a starting point when organizations are thinking about how gamification can be used externally and internally. Clearly defined goals: For organizations and players, it should be clearly stated what the gamification initiative is intended to accomplish. Not a Panacea: While there is great promise in gamification for organizations but it should not be considered an answer for everything. Blindly applying gamification without thinking through organizational repercussions can be a recipe for disaster. Measure, Measure, Measure: Gamification is used for organizational improvements whether it is used for external purposes or internal purposes. Since it is about organizational improvements, its progress needs to be measured, feedback should be obtained from its users and should be updated as needed. It is about Values: When using gamification, organizations need to understand that it is not a one-way street but a multi-way street where value needs to be created for everyone involved. As we have seen throughout this research paper, gamification has implications across many different aspects of an organization whether it is applied externally and/or internally. Due to the continuous improvements in technology and our desire to be better, there will always be new business models where gamification can prove to be useful. Here organizations have a choice of ignoring it as a passing fad or getting ahead of it to understand how it can help them transform themselves. Thus, gamification will continue to be an emerging technology regardless of where it stands in Gartner’s Hype Cycle. Next Is Internet a Distributed System?